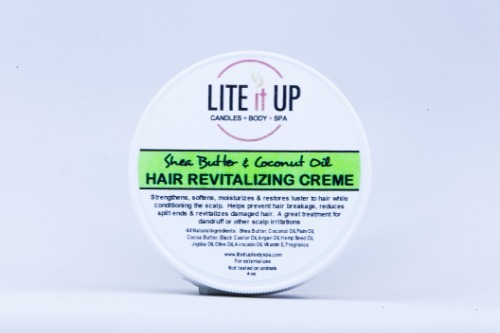 HAIR REVITALIZING CREME - 4oz - Lite It Up Corp.
Strengthens, softens, moisturizes, and restores luster to hair while conditioning the scalp. Helps prevent hair breakage, reduces, split ends & revitalizes damaged hair. A great treatment for dandruff or other scalp irritations. Use this stuff to style my hair all the time! Great chemical free product, smells amazing and a little goes a very long way!!! This stuff is amazing and has my hair feeling very soft and very moisturizer. I've been looking everywhere for something for my curls and this stuff has by far beats anything I've tried. I want to buy a bucket of this stuff lol, I will deffanitly be buying a lot more of this product it's GREAT!!!!! !